All over the world carbon-intensive lifestyles contribute to floods, droughts, wars and continued exploitative exploration. We remember Ken Saro Wiwa and others who challenged Shell’s oil exploration in Nigeria, receiving the death penalty instead of being listened to. 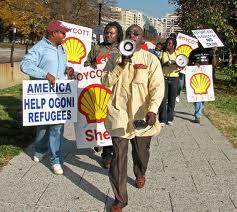 We also remember those people all over Africa challenging environmentally destructive ‘development’. But are Scottish Africans concerned that Black indigenous cultures face environmental injustice? Environmental Justice is increasingly seen as an anti-racism issue. ‘Environmental racism’ (the disproportionate impact of climate and environmental injustice on Black and indigenous communities) contradicts Human Rights agendas on access to clean, healthy environments for all. How does climate change in Africa and the Caribbean affect our daily lives here? As research develops fresh evidence highlights UK ethnic minorities greater exposure to poor air quality – a consequence of disproportionately living within areas of multiple deprivation where there’s also high concentration of airports and carbon-heavy industries. BME communities therefore live daily with pollution – often coming off worst in climate change terms. What can Scottish Africans do practically to combat the affects of climate change in our daily lives? Promote low carbon technologies through the greening of the African Caribbean Centre refurbishment which can also highlight domestic A&C fuel poverty. – Providing tools and perspectives for developing multiracial perspectives and inclusive strategies for direct action through videoconference links with MEND (Nigeria); Capacity Global (UK) and author Van Jones (US) – making solidarity links between affected communities in African and Caribbean nations and Scottish Diaspora A&C communities. – Highlighting the inspiring tradition of resistance to environmental racism by marking the 15th Anniversary of Saro Wiwa’s execution with a guest speaker from Remember Saro Wiwa campaign. – Overcoming barriers to participation through challenging perceptions of those interested in climate change on race and class grounds, relating climate change to immediate concerns of poverty, unemployment & poorer housing, providing platforms for refugees and asylum seekers to speak about climate justice – a key reason for seeking sanctuar, encouraging our communities to take the necessary positive action for climate justice, looking at Scottish African & Caribbean attitudes to climate change – and make preparations by reducing high carbon emitting activities and wasteful consumption, encouraging greater A&C participation and planning of future Climate Camp events. 16th April – 6pm African, Caribbean Network Office, 6pm 30 Bell Street, Glasgow – Ben Amunwa of Remember SaroWiwa Project leads “No Condition is Permanent: oil politics and resistance” – a discussion-based workshop on strategies to address environmental injustice, it’s race, class and gender impacts, in Africa and beyond. 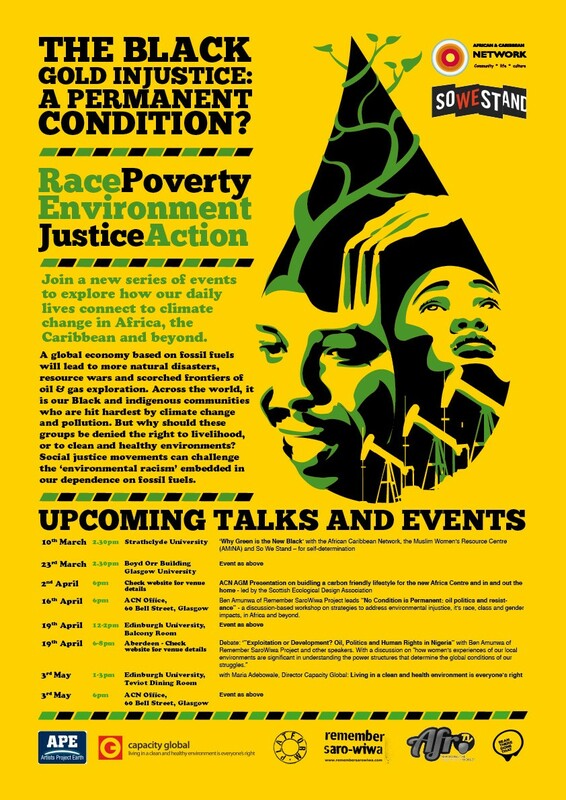 19th April – Edinburgh University, Balcony Room, 12-2pm Ben Amunwa of Remember SaroWiwa Project leads “No Condition is Permanent: oil politics and resistance” – a discussion-based workshop on strategies to address environmental injustice, it’s race, class and gender impacts, in Africa and beyond. Why Black is the New Green organisers are from all over the UK. We recognise the integral links between anti-racist struggle, social justice and environmental injustices. We are committed to integrating an anti-oppression framework and analysis into all of our work. This means addressing whose voices are heard, which priorities are chosen, what actions are taken, who does the work, and who gets the credit. The African and Caribbean Network Ltd (A&CN) (www.acnglasgow.org) is a voluntary sector umbrella organisation and coordination body providing surgery, advice and support services in housing, anti-poverty work, employment, group capacity building and community development for 40+ African and Caribbean community groups representing 10,000 people in Glasgow and the surrounding region. So We Stand (www.sowestand.com ) So We Stand is a peoples movement for empowering social change building self defence strategies to better our lives and communities. We provide training, support, and solidarity to grassroots struggles for environmental, social and multi-racial justice. We engage with popular education to build a culture of creative action and self-determination connecting different local experiences of injustice to protect life. AfroGossip (www.truegossip.co.uk) are an inspirational medium for African & Caribbean communities based in Scotland? We promote and encourage greater awareness and appreciation of the African culture through media. We showcase and create opportunities for fresh talent and already established entertainers/ performers of all backgrounds while developing Black pride to challenge wrongful stereotypical views associated with people of black origin. AMINA – The Muslim Women’s Resource Centre (http://www.mwrc.org.uk/) Amina the Muslim Women’s Resource Centre is a Scotland-wide Charity works with mainstream agencies and policy makers to enhance their understanding of muslim community and of barriers preventing muslim women from accessing services and participating in the society. MWRC also provides direct helping services, community development and a listening ear to muslim women. Remember Sarowiwa (http://www.platformlondon.org/remembersarowiwa/events.htm) Remember Saro-Wiwa is a coalition of UK-based organisations and individuals encompassing the arts and literature, human rights and environmental and development issues. Platform London (http://www.platformlondon.org/) PLATFORM works across disciplines for social and ecological justice. It combines the transformatory power of art with the tangible goals of campaigning, the rigour of in-depth research with the vision to promote alternative futures. Capacity Global (www.capacity.org.uk) believes that everyone has the right to live in a clean and healthy environmen. Any action, item or process infringing on this right can be described as environmental injustice. We work specifically with people and communities in urban areas, who suffer most from environmental injustice, to ensure their voices get heard and fight environmental injustice to create opportunities for environmental justice. Scottish Ecological Design Association (SEDA) (http://www.seda.uk.net/) aims to promote the design of communities, environments, projects, systems, services, materials and products which enhance the quality of life of and are not harmful to living species and planetary ecology. Artists Project Earth (APE) ( www.apeuk.org/) aims to create a better world through the power of music and the arts. Reflections on The Black Gold Injustice: Where Next?